Javier Rodriguez has been a part of the new DAREDEVIL series from the start, primarily as colorist, but is now showcasing his pencil work as well. Here we talk about his work with all the artists on the series, including Paolo Rivera and Chris Samnee, and writer Mark Waid. Kuljit Mithra: Thank you very much for this opportunity to interview you. Your 2-parter as penciler and colorist on DD recently came out (#28-29), so I was wondering how far ahead are you right now? What issue are you currently working on? Javier Rodriguez: Well, I just finished SUPERIOR SPIDER-MAN ANNUAL #1, with Alvaro Lopez inks, and pencils and colors by me. At this moment I'm working on DAREDEVIL #34, pencils and coloring. And I'm doing colors for issue 33 at the same time. Mithra: I do want to discuss your recent work here, but let's first talk about your involvement with the relaunched Volume 3. At first glance, the title's artwork has been a departure from the years before it. I believe you worked with editor Steve Wacker on AMAZING SPIDER-MAN, so when he approached you to color this new series, what was the interest for you? Was it the chance to work on this different take on DAREDEVIL? Rodriguez: DAREDEVIL was an opportunity to do a brand new color design from the beginning. And was a challenge. I tried to do a personal approach to the art; each artist deserves a different approach when you start coloring. I did colors for Paolo [Rivera] on AMAZING SPIDER-MAN but I was unhappy with how that issue came out, so this time I wanted to do something better. Mithra: I've interviewed a few past DAREDEVIL colorists, including Matt Hollingsworth, Gregory Wright and Christie Scheele, and I believe in an interview at Marvel.com you said you were a fan of Scheele's work on the book. What was it about her work that you admired, considering she worked at a time when she still put CMYK codes on photocopies. Have you ever worked with that method? Rodriguez: I'm a former graphic designer. And when I started my studies, back in the early 90's, that was the way to do it, all analogic. But suddenly digital methods popped up, so I was lucky because I learned how to work in both worlds. Those days of DIY I learned a lot about printers, how all the process from your table to final print works. That said, colors are the same, at the end you have to deal with same color theories. And a Magenta doesn't change printed or on a screen. 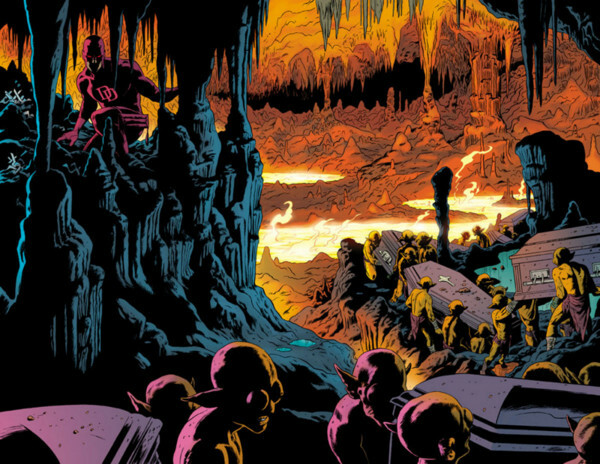 Mithra: You've worked with some great artists on DD, including Paolo Rivera and Chris Samnee. As a colorist, is there a different approach to how you color over their art? Or are you more concerned with lighting, scene locations etc. than who drew it? Rodriguez: Yes. As I mentioned before, every artist deserves different approaches. I had a color scheme for the series based on Paolo's style and I kept it during Samnee's first issues. But as soon as I knew that Chris would be the regular artist, I completely changed the focus and I looked for more flat and primary colors. Chris has a powerful black and white art, strong lines, so you don't need any modelling. Just try to focus the reader's eye in a narrative way. Mithra: For many comics readers, who have not followed the title, they have this impression that the title is not "dark" and Daredevil is running around cracking jokes and smiling. And they sometimes point to the bright, more solid and contrasting colors that you have chosen (along with the artistic styles of Rivera and Samnee). Do you think that's a fair statement, and does that ever come into play in your decisions for colors? 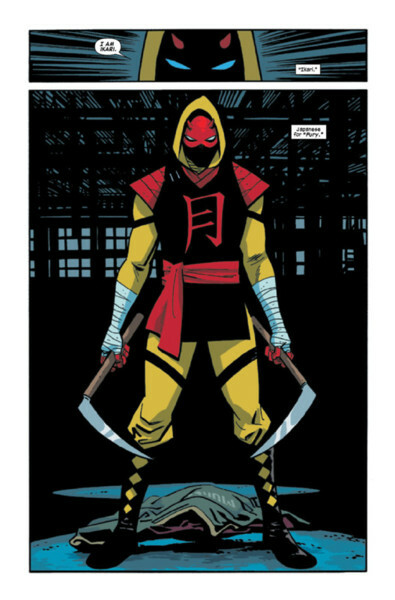 Rodriguez: If you look at the colors of DAREDEVIL in the eighties, they are very vibrant. I think that a rich palette doesn't mean less serious. But it is just a matter of taste. I don't know, each reader has his own preferences. I respect that, obviously. Mithra: Just to get technical for a moment... what kind of hardware and software do you use to color, and typically what is involved for a page... do you first do flats and then complete? Do you scan in the pages? Is "flatting" the same as "separations"? Rodriguez: I use Photoshop most of the times. For pencils I'm working with Manga Studio recently. And yes, first I do a flat coloring and then going for details and some modelling here and there. I'm not sure which is the appropriate term. The "separation" term I believe that came from those days when you did a real separation, that's meant to do a CMYK plate for each of the four print colors. But when digital coloring began people still used this term when they're talking about doing flat layers. All sounds way too technical but it's easier than it sounds. At the end, colors in print comics are the same as in the past decades, its just an optic illusion that tricks your mind into thinking you see a full spectrum where there are only four colors (CMYK). Mithra: I believe you live in Spain, so how is it working with various members of the team who are spread across the planet? Are you in constant contact with Mark Waid about a panel description, or with the editors about color schemes of a villain's costume etc.? Rodriguez: Yes, I live in Barcelona, Spain. And we're in contact trough mail constantly. Before I start on a book Steve [Wacker] or Ellie [Pyle] send me references if these are necessary, and Chris will do notes sometimes for particular issues, also. Mithra: What have been some of your favorite pages you've colored so far on DAREDEVIL, and why? Rodriguez: There are a lot of them. I like the colors in some Paolo's issues a lot, Klaw's reds in the basement scene or the battle with the Mole Man amongst crystals. That was fun. A lot of the pages with Chris's art. The Superior Spider-Man issue, with all these oranges or the whole battle with Ikari, so much fun to do. And I'm especially proud of introducing the magenta as radar vision, that's my idea and I still like it. Mithra: Coming back to issues #28 and #29, you did the penciling artwork and the colors. They have been really well-received, but I'm wondering if you had any initial concerns about taking on the job, considering the art talents that have come before? Rodriguez: The weight to me was because Daredevil, among with Fantastic Four and Spider-Man, is my favorite superhero. Born Again is probably on my top of the list. 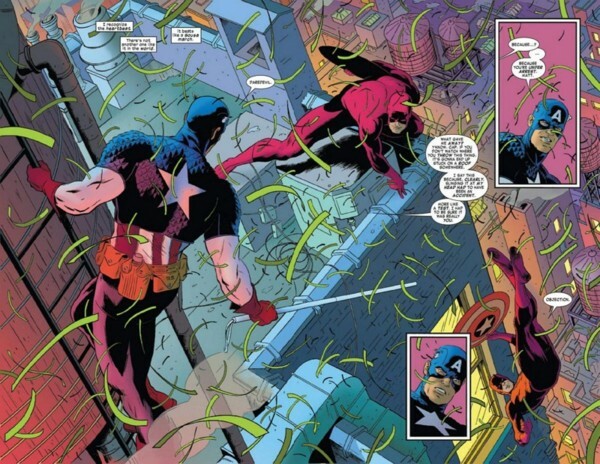 And the work of John Romita Jr with Williamson (and those fantastic Nocenti scripts). That's a lot of pressure, yes. But I can't say no to drawing one of my favorite characters. No way. Mithra: I know I've mentioned it to you before, but I thought some of the layout choices and angles used were quite good. How long did it take you to do all the planning, considering you must have done some sketches first, then also had to determine the color choices as well. Rodriguez: When I do the layouts for a comic I always have coloring on mind. Doing the layouts is my favorite part, so yes, this takes me a lot of time because this is when you're actually making the comic. Once you have the layouts ready, the next steps are just craftsmanship. The true art of comics lies on the layouts in my opinion. Mithra: And last question... is DAREDEVIL keeping you occupied full-time, or are there other projects from Marvel or other companies that you can talk about? Rodriguez: Right now DAREDEVIL is my only duty. Hope we'll have enough success to be here much longer because I love it.